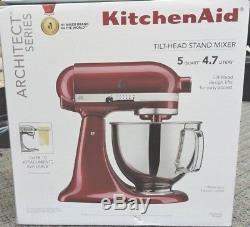 KitchenAid 5 Qt Architect Series Tilt-Head Stand Mixer Grenadine KSM150APSGD. The item "KitchenAid 5 Qt Architect Series Tilt-Head Stand Mixer Grenadine KSM150APSGD" is in sale since Monday, January 14, 2019. This item is in the category "Home & Garden\Kitchen, Dining & Bar\Small Kitchen Appliances\Countertop Mixers". The seller is "arod829" and is located in Maple Shade, New Jersey. This item can be shipped to United States, Canada, United Kingdom, Denmark, Romania, Slovakia, Bulgaria, Czech republic, Finland, Hungary, Latvia, Lithuania, Malta, Estonia, Australia, Greece, Portugal, Cyprus, Slovenia, Japan, China, Sweden, South Korea, Indonesia, Taiwan, South africa, Thailand, Belgium, France, Hong Kong, Ireland, Netherlands, Poland, Spain, Italy, Germany, Austria, Bahamas, Israel, Mexico, New Zealand, Philippines, Singapore, Switzerland, Norway, Saudi arabia, Ukraine, United arab emirates, Qatar, Kuwait, Bahrain, Croatia, Malaysia, Brazil, Chile, Colombia, Costa rica, Panama, Trinidad and tobago, Guatemala, Honduras, Jamaica, Viet nam.